Set in the golden age of pirates and merchant adventurers, players can trade for fabulous cargoes in exotic ports and build up a treasure of gold, silver and copper Dubloons. 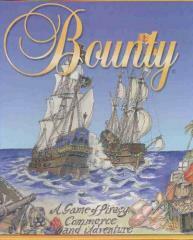 Bounty is both a card game and a board game. The fun is that most of the time nobody knows who is a pirate, who is a merchant and who might be a warship. There are plenty of opportunities for trading in exotic cargoes, skulduggery, piracy on the high seas and sweet revenge! Bounty is full of fantasy, fun and rapid and dramatic changes of fortune! It requires luck, strategy and more than a little cunning to win!